A couple of incidents in the last little while set me thinking about professionalism in sport. To most people this probably means getting payed for what you do. Surely then, to orienteering, where even in Scandinavia the number of people who fall anywhere near this category can probably be counted on one hand, it has no relevance. However, I think of professionalism in a wider context. Last year the All Whites coach Anthony Hudson made headlines when he voiced his opinion that many aspiring young footballers were assuming that talent enough would see them achieve their ambitions and were not adopting a lifestyle that would go a long way to helping them do so. The same applies to orienteering – talent alone is not enough. Hard work, a sensible lifestyle, and the willingness to listen and learn, in short, being “professional” in one’s approach to sport are necessary. I will emphasise straight out that this does not mean putting all other aspects of life on hold. What it does mean is building the sport into the fabric of your lifestyle so that it is benefitted, and not hindered, by everything else. Professionalism is what High Performance sport is about whether you are paid for it or not. As HP leader I can help create the structures, but it takes two to tango….. Anyway here we have reports on last weekend’s trials, information (and comments from Tim Robertson) on the prospective new sprint formats for WOC, a look ahead to Oceania, and announcement of various teams. About 90 prospective team members and SuperSeries entrants descended on the Wellington region for a weekend of racing that taxed technical and physical capabilities over all three distances. In the elite grades the standout performers without a doubt were Nick Hann and Ross Morrison among the men, and Imogene Scott of the women. Things were a little more complex in the 20 classes. Although Danielle Goodall figured in the top two in all the races, in both M20 and W20 the three races saw three different winners. The weekend kicked off with the sprint on Whitireia Polytechnic in Porirua. For those who did not race at the Waitangi Sprints in 2016, Whitireia, although small, is an incredibly detailed and complex campus featuring narrow covered passageways between a myriad of buildings. Lizzie Ingham’s courses used these to great effect offering both technical navigation throughout but also some complex longer route choices as shown in the first part of the W21/W20 course below. Winning times were almost spot on 12 minutes, although Ross and Imogene both crept under this target, Ross having over half a minute on Nick in second place, and Imogene a similar margin over Jenna Tidswell who was the fastest of the W20s 8 seconds ahead of Danielle. In M20 Tommy Hayes, despite suffering from a bug which affected his subsequent performances and indeed led him to not start the long distance, kept out Devon Beckman by the smallest possible margin. M21E 2.94 k: 1. Ross Morrison (HB) 11-38, 2. Nick Hann (PAPO) 12-16, 3. Jonty Oram (A) 13-11, 4. Gene Beveridge (NW) 13-12, 5. Jamie Stewart (OBP) 14-06, 6. Carsten Joergensen (PAPO) 14-14. M20 2.94 k: 1. Tommy Hayes (A) 12-02, 2. Devon Beckman (HB) 12-03, 3. Cameron de L’Isle (NW) 12-32, 4. Stephen Harding (PAPO) 13-01, 5. Ed Cory-Wright (PAPO) 13-08, 6. Kurtis Shuker (CM) 13-31. W21E 2.56 k: 1. Imogene Scott (A) 11-55, 2. Jula McMillan (NW) 13-08, 3. Becky Gray (W) 13-57, 4. Sarah O’Sullivan (W) 15-00, 5. Jenni Adams (PAPO) 15-51, 6. Penny Kane (OBP) 15-53. W20 2.56 k: 1. Jenna Tidswell (HB) 12-21, 2. Danielle Goodall (CM) 12-29, 3. Kayla Fairbairn (NW) 12-46, 4. Marina Comesky (W) 13-13, 5. Carolyne Nel (HB) 13-14, 6. Meghan Drew (A) 13-32. Saturday afternoon saw everyone move 2 km up the road to Colonial Parklands on the side of Colonial Knob. This is an area which is a mixture of open land, pines, eucalyptus, native bush and scrub all on a steep hillside. 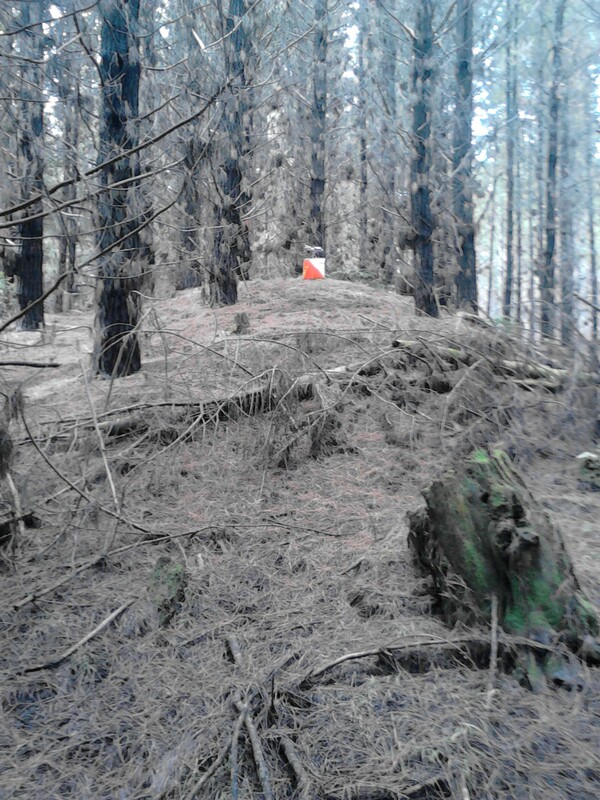 Potential as an orienteering area improved dramatically when the Mana MTB club started constructing a track network that extends into the DOC reserve below Colonial Knob which hosts the reservoirs which were Porirua’s original water supply. A small area but with, as it proved, enough intricacy and physicality to cause problems. In M21 Nick and Ross were in a class of their own, being the only two to break 30 minutes and swapping the lead a couple of times before Nick opened up a gap from control 13 that Ross was never able to close. In W21 (shown on the left) Penny Kane headed Imogene by 90 seconds, although they were both well behind Katie Cory-Wright who took the lead in W20 at control 4 and never relinquished it. Danielle and Alice Tilley in 2nd and 3rd in W20 were also both faster than Penny. In M20 Ed Cory-Wright made it a brother-sister double with Cameron de L’isle and Devon in the minor placings, and Stephen Harding repeating his 4th placing from the morning. Unfortunately the slippery conditions led to Sophie Harrison again dislocating her shoulder – an injury that will now keep her out of JWOC for the second consecutive year. M21E 2.9 k: 1. Nick Hann 27-40, 2. Ross Morrison 29-25, 3. Jamie Stewart 34-09, 4. Jonty Oram 37-33, 5. Carsten Joergensen 37-59, 6. Bill Edwards (OHV) 39-32. M20 2.9 k: 1. Ed Cory-Wright 31-47, 2. Cameron de L’Isle 32-12, 3. Devon Beckman 34-19, 4. Stephen Harding 34-38, 5. Calum Sutherland (T) 34-36, 6. Joseph Lynch (W) 36-13. W21E 2.6 k: 1. Penny Kane 34-26, 2. Imogene Scott 36-10, 3. Jula McMillan 38-11, 4. Sarah O’Sullivan 41-13, 5. Jenni Adams 41-42, 6. Becky Gray 42-17. W20 2.6 k: 1. Katie Cory-Wright (PAPO) 32-29, 2. Danielle Goodall 33-44, 3. Alice Tilley (NW) 35-32, 4. Lara Molloy (W) 36-36, 5. Kayla Fairbairn 36-45, 6. Sofie Safkova (NW) 38-19. On Sunday the scene of action moved to Waitarere Beach and a resurrection of the Hydrabad map, first used for the APOC Relays in 1994 but now very much changed as a second-growth forest. 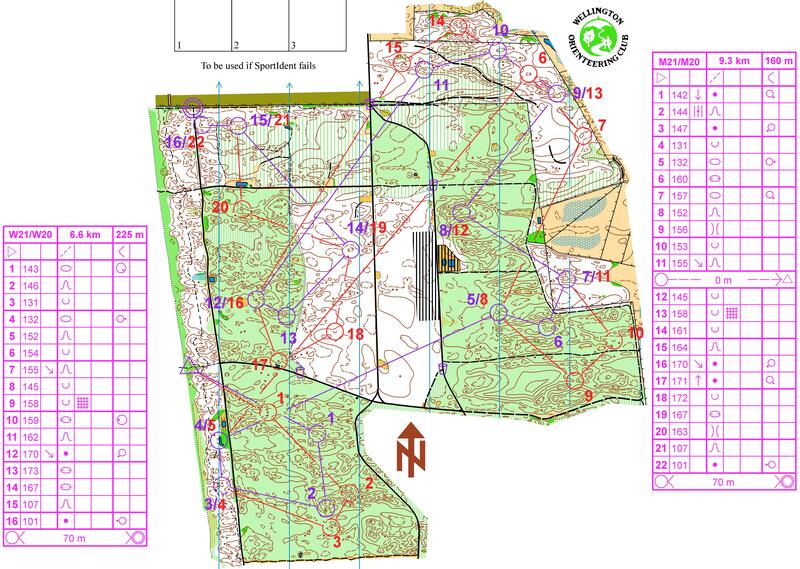 With over half of the map light green and rough underfoot this proved an excellent setting for the long distance trial – the men’s (red) and women’s (purple) courses are shown below. Thrown straight into the light green, there were many errors early on as runners came to grips with the low visibility and a 5 m contour interval rather than the more normal 2.5 m on many sand-dune maps. In this regard the legs from 1-2 for both the men and the women caused problems. Long legs across the map then gave the choice of running the track network or taking a much more direct line through the blocks. Once again Nick, Ross and Imogene were ahead of the game with Nick and Imogene running near-perfect races and fabulous times, and Ross 5 minutes back from Nick. Among the men, unlike the sprint and the middle distance where the majority of the top 10 fastest times came from the M20s, the situation was reversed with 7 of the top 10 times being by the M21s. In M20 Nick Smith came into his own with a 10 minute win over Callum Herries and a further 2 minutes to Ed in 3rd, these being the only 3 to get amongst the M21s. After 2 second places Danielle finally took the honours in W20 with the second fastest time on course 2, 3 minutes ahead of Alice and 7 ahead of Lara Molloy in 3rd. M21E 9.3 k: 1. Nick Hann 63-31, 2. Ross Morrison 68-37, 3. Gene Beveridge 74-38, 4. Karl Dravitzki (T) 75-22, 5. Carsten Joergensen 77-11, 6. Jonty Oram 78-53. M20 9.3 k: 1. Nick Smith (PAPO) 70-30, 2. Callum Herries (HB) 80-37, 3. Ed Cory-Wright 82-23, 4. Devon Beckman 87-30, 5. Calum Sutherland 88-28, 6. Callum Cleary (PAPO) 88-47. W21E 6.6 k: 1. Imogene Scott 57-15, 2. Jula McMillan 79-08, 3. Sarah O’Sullivan 80-59, 4. Penny Kane 83-55, 5. Jenni Adams 86-30, 6. Becky Gray 88-53. W20 6.6 k: 1. Danielle Goodall 68-39, 2. Alice Tilley 71-12, 3. Lara Molloy 75-13, 4. Jenna Tidswell 75-41, 5. Sofie Safkova 77-41, 6. Tegan Knightbridge (NW) 78-17. So, yes, a challenging weekend after which it is now down to the selectors to name their teams for not only the World Games and JWOC, but also the schools team for the ANZ test match in Rotorua. With the M/W20s competing on the same courses as the M/W21s all weekend the SuperSeries points for the Seniors included both fields. Now, after 6 rounds of the 2017 Series the top 10 positions and points in each class have been updated. In M21E Gene Beveridge holds a narrow 3 point lead over the 2016 M20 winner Tommy Hayes. However, despite both having missed Round 1 in the South Island, Ross Morrison and defending title holder Nick Hann have moved up into 3rd and 4th places respectively, with Ed Cory-Wright and Carsten Joergensen next, and Matt Ogden, with just 2 scores from Round 1, lurking behind. Imogene Scott’s form over the weekend has seen her squeak ahead of Lizzie Ingham while Danielle Goodall (W20 winner from 2016) has moved into 3rd in W21E. Missing Round 2 has seen Renee Beveridge, previously in 2nd, drop to 6th. Tommy, Ed and Cameron de L’Isle form a closely spaced trio at the top of M20, covered by only 8 points, while Stephen Harding’s consistency over two rounds has seen him move into 4th place. Katie Cory-Wright has now recorded 3 victories in W20 and has a comfortable lead over Alice Tilley with Jenna Tidswell just behind. Danielle, with her just her 3 scores from the weekend, has moved into 4th just ahead of Tegan Knightbridge. With 9 out of 12 events to count it is still early days, but the next round at the Oceania Championships may see some of the big names making their moves. 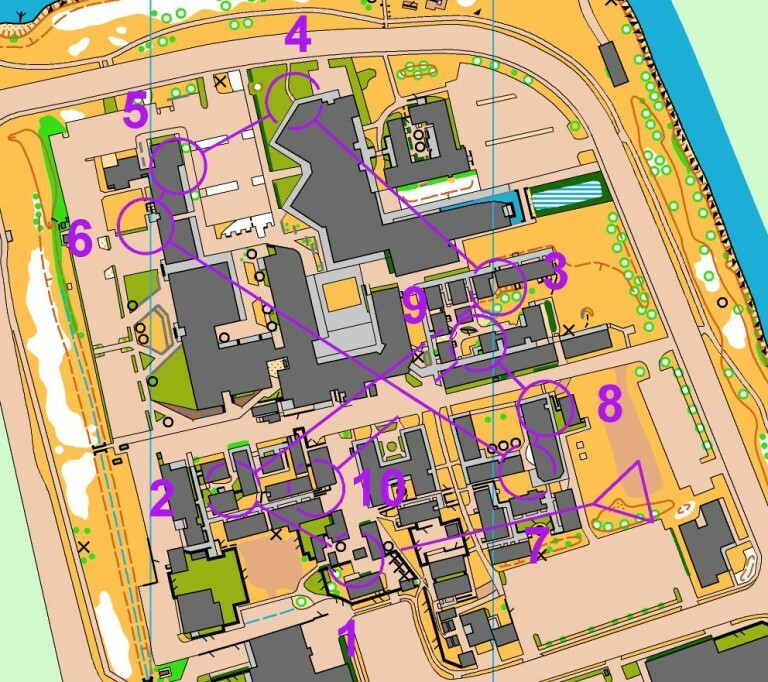 Two different knock-out sprints were successfully tested during the Mediterranean Orienteering Championships camp in Italy earlier in the moth; one with a mass start (NORT-style) and one with a chasing start based on qualification results. The NORT-style had a time-trial qualification heat followed by semi-finals and a final with a mass start and forked legs. The chasing start was the second format – a time-trial qualification followed by semi-finals with a chasing start based on the qualification race, and then followed by a final also with chasing start based on the semi-finals. The chasing start knock-out sprint was tested without forked legs. “The competitions were great and all the competitors were very happy, but of course there were some problems about the new formats. For me personally I think these systems will only work in some terrains. And definitely not the terrains the last WOC’s have been in. The navigation would be far too easy and therefore it would just be a big running race. I’m interested to hear what the outcome will be around these formats. I have a lot of contact with those behind the ideas so I will let you know what I hear around the decisions and other possible formats. The IOF Foot Orienteering Commission will now evaluate the tests in detail and will also send out a questionnaire to the participants. Further tests will then be carried out during the year. The goal is to propose a suitable third sprint WOC format for the IOF Council for their meeting in October 2017. In 2018 there will be more fine-tuning of the format, but the basics need to be approved this autumn so that the WOC 2020 organisers, where the new format will be first used, can start their preparations. Congratulations to Lizzie Ingham (WN), Ross Morrison (HB), Laura Robertson (HV) and Tim Robertson (HV) who have been named as the NZL team for the World Games. The World Games will take place in Wroclaw, Poland from 25-27 July. There is a very restricted, but very high quality, field of only about 40 men and 40 women including all reigning World Champions. There are three races, an individual sprint, a middle distance and a sprint relay. NZL has been at both of the previous two World Games which were in Taiwan in 2009 and Columbia in 2013. Similarly, following the trials weekend, congratulations to the following who have been selected in the New Zealand Schools team to race against Australia at the Middle Earth events in Rotorua on 19/20 April. Senior Boys: Stephen Harding (PP), Joseph Lynch (WN), Kurtis Shuker (CM),Calum Sutherland (TK), Reserve – Daniel Monckton (NW). Senior Girls: Katie Cory-Wright (PP), Danielle Goodall (CM), Sofie Safkova (NW), Jenna Tidswell (HB), Reserve – Marina Comeskey (WN). Junior Boys: Cameron Bonar (NW), Ryan Moore (NW), Campbell Syme (AK), Will Tidswell (HB), Reserve –Oliver Edwards (HV). The test match consists of an individual race on Tuesday 19 April, followed by a sprint relay on the 20th. Oceania sees not only the ANZ Challenge but is also a Test match in the elite and junior elite grades. The New Zealand team for this is still being finalised as the selectors juggle availability and non-availability for some of the races due to various people being involved in mapping and planning. However, the Australians have names a very strong team in the elite grades where, of course, a win in either the middle or long distance races earns an automatic entry into this year’s World Championships in Estonia. Two years ago in Tasmania these honours were shared with New Zealand winning the men’s and women’s middle distance spots through Matt Ogden and Lizzie Ingham respectively, and Australia the two long distance places. On home terrain hopefully we can go better than this. With both men and women sitting in Group 2 for WOC2017 (i.e. 2 men and 2 women in each of the middle and long) an extra spot in all races would effectively put us in Group 1 for this year. Round 1 this year consists of a sprint relay (24 May), an individual sprint with both qualification and final (25 May), a middle distance (27 May) and a long distance with a chasing start (28 May). Congratulations to Tim Robertson for 3 excellent races at the Danish Spring Cup – particularly his win by 38s in the sprint, but also 7th place in the middle distance and 9th in the long. Laura Robertson and Toby Scott were also present with Laura taking placings of 10th and 24th in the sprint and middle respectively, and Toby 30th and 57th.